If you're using the original, O'Reilly-only version of Atlas, here's what you'll need to do to import your projects. To do this, you'll need to use Git on the command line. There are two things you need to do before you can migrate a repo over to Atlas 2. First, you must have an account. If you're an O'Reilly author, contact your editor for details on getting a registration code. Second, you must add your SSH key; follow the instructions here. Figure 15-1. 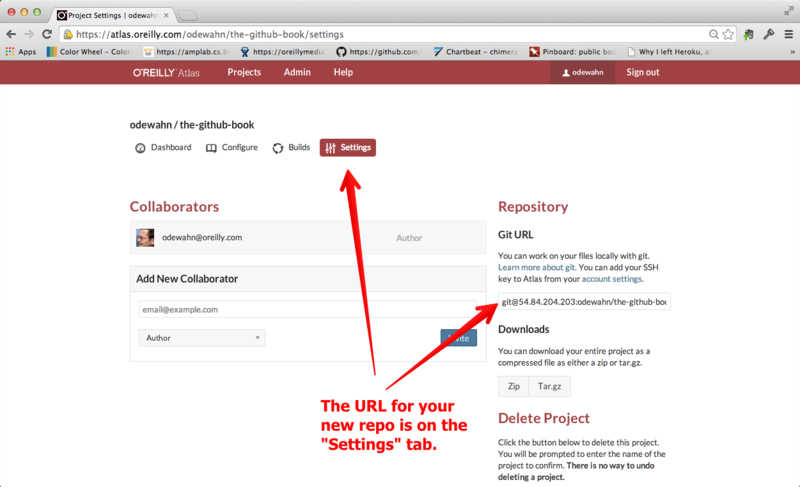 You'll find the URL for your repository on the Admin tab. remote: Counting objects: 2831, done. remote: Compressing objects: 100% (2535/2535), done. Receiving objects: 100% (2831/2831), 20.34 MiB | 977 KiB/s, done. Note that your password is the same as your password when you log into Atlas. Figure 15-2. 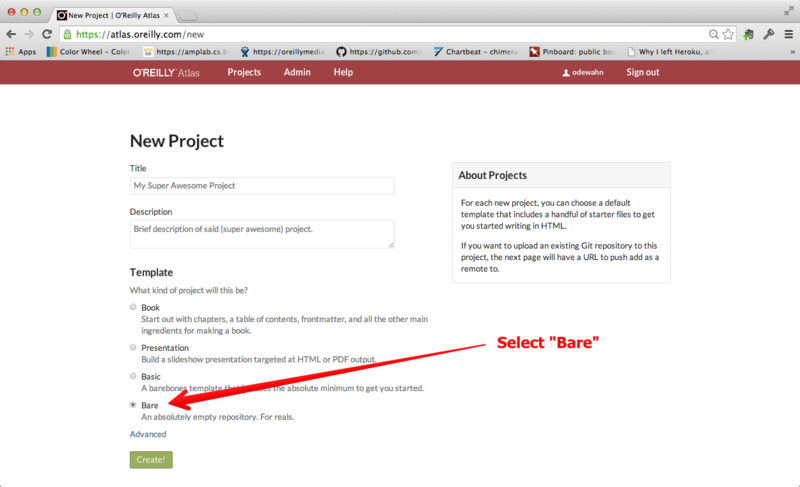 Create a bare repo to accept your project. 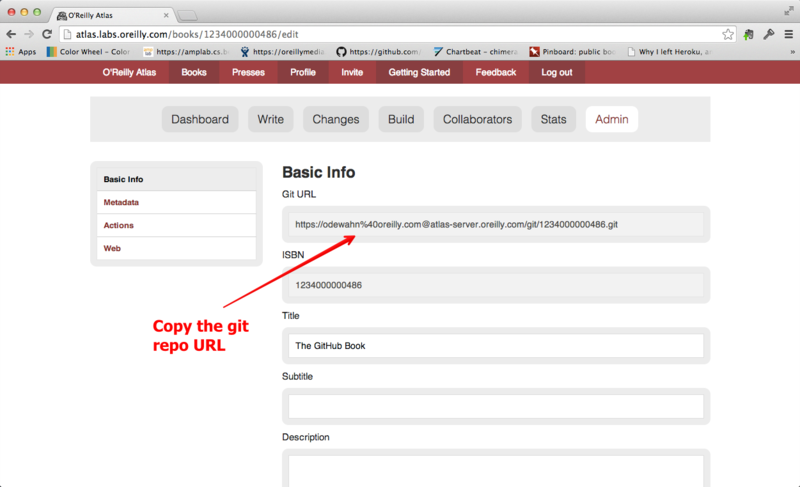 Once you've created the new repo, go to the Project Settings tab and copy its Git URL. Figure 15-3. Copy the Atlas 2 repo URL. Once you have the new repo's Git URL, return to the command line client and add a remote to the repo you want to move. Then, push it. Note that you may be prompted to verify the identity of the Atlas 2 Git server the first time you push. If so, just type "yes" at the prompt. The authenticity of host '54.84.204.203 (54.84.204.203)' can't be established. RSA key fingerprint is 35:4b:68:ee:42:aa:2a:b3:0e:0a:6f:87:0e:5e:b3:87. Warning: Permanently added '54.84.204.203' (RSA) to the list of known hosts. Compressing objects: 100% (1329/1329), done. Writing objects: 100% (2831/2831), 20.34 MiB | 1.30 MiB/s, done.